At first, The Dog Stars, by Peter Heller, is a difficult read. Heller eschews traditional sentence and paragraph structure. Instead of complete sentences, often the narrator of the novel “talks” in incomplete phrases, partial thoughts, and stream of conscious ramblings. Dialog is not distinguished from the narrator’s own internal voice. However, once you get by this odd composition, behind it is a story that is both touching and harrowing and certainly worth the effort. 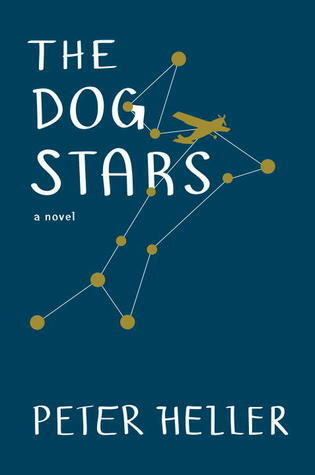 The Dog Stars takes place in Colorado, in an America, a world, that has been decimated by a plague of unknown origin (though at one point, Livermore is blamed…). Whatever the origin, the current reality is that very few people are left and those that are either roam the countryside looking for supplies to scavenge and loot or have holed up in various compounds that they then defend against the roaming tribes. It is in exactly this situation that the protagonist, Hig, finds himself in. Hig and another man, Bangley, have taken residence in a neighborhood near an airport — Hig is a pilot — which, thanks to Bangley’s meticulous planning and military mindset, they have successfully defended against numerous attacks. However, having a creepy gun obsessed guy as his only “friend” starts to wear on Hig. Hig is lonely. Hig misses his wife. Hig wants more than to fight off a never ending hoard of invaders. The novel follows Hig’s journey, both internal and external, of self-discovery, of finding what exactly he wants out of life in this new world. Along the way, we learn what it takes to survive in such a place, where all infrastructure is gone, people survive on their wits, and no one trusts anyone. How does Hig find purpose in a world where everything has been destroyed? Isn’t there more to life than simply defending his house, his dog, and his plane? Hig’s journey takes us along a path where he learns what it means to be human again in a world that humanity seems to have abandoned. If you can make it through the odd compositional structure, the novel weaves a rich tapestry and has enough twists and turns to keep you turning the page. However, it certainly isn’t for everyone, as the structure may be too strange to digest for some. But, if you get by that, the novel rewards you with a story that certainly is heartfelt and gratifying.